Nitro Coffee has never been easier! We produce, we install, we deliver, we maintain. 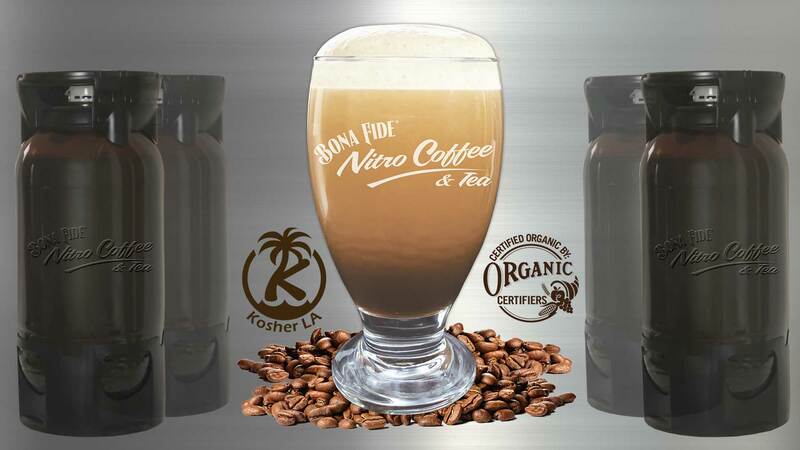 Bona Fide is your nitrogen infused coffee and nitro tea solution! AWARD-WINNING QUALITY, THE BEST ON THE MARKET! GET YOUR NITRO COFFEE NOW! Buy Bona Fide Nitro Coffee and Tea for your existing dispensing equipment in our PET disposable kegs. Please visit our store. Bona Fide flows with the natural EVOLUTION of society! We fulfill MODERN expectations of sophisticated taste and convenience. Cowboy coffee is a thing of the past. NITRO IS NOW! Bona Fide is aligned with the natural evolution of civilization. Much like the rotary phone, past methods of brewing coffee from beans or grounds on premises are both labor intensive and incompatible with modern expectations of quality and convenience. Bona Fide's efficient, high-quality process for producing coffee in kegs and delivering them to your office or business, is the latest evolution of beverages with caffeine. By moving the preparation steps from your kitchen to our brewery and eliminating the barriers of entry at the retailer level, It is now easy for you to serve Nitrogen-Infused Products at your office break room, shop or other food service establishment, without a lot of mess and drama. Bona Fide Kegs can ship and store ambient for more than 30 days. Great TASTING pours from the first tap to last drop! Bona Fide Nitro Coffee invented a proprietary processing technology called “Craft Draft”. Food safe, flavor-fresh stability is embedded into our kegs keeping them tasty and fresh for at least 120 days. That is 4 times the life of our closest competitor. Every keg we produce is created using the Craft Draft process. We extract the best flavor from the beans or tea, maintain the volatile nuance flavors of that each variety presents and preserve them under strict sanitation and preservation standards. EASY to serve! Just pull the tap handle and enjoy! SAVE time, labor and space in your place. No old, standing coffee to pour out and no messy PREPARATION! We offer both staff-pour or self-service solutions. Whether you are looking for coffee on tap for your break room or wholesale for your food service operation, we make serving draft nitro coffee simple and easy! Pull the tap handle and enjoy great tasting coffee on tap on demand! Each 5.16-gallon keg pours until empty, good to the last drop. Compare that to labor-intensive coffee brewers which are prone to problems such as the effects of hard water, a timed-out product that tastes bad and disappoints your customers and scores of other trouble spots which translate into a mediocre taste experience. Office and food service professionals report up to 50% of brewed products going to waste due to those uncontrollable circumstances. Bona Fide eliminates those hurdles in one elegant solution. Bona Fide offers the widest VARIETY of kegged nitro products available from one vendor. Each has been developed to DELIGHT the taste buds of your customers! Every keg is made with our AWARD WINNING stability for lasting freshness. Keg coolers and draft equipment solutions, installation and N2 Gas. FREE Delivery, FREE training, FREE POS! *With our DSD program in select markets only. Since we want to make it as easy as possible for you to serve our products on tap, we decided to make much of it FREE. We set up or convert your keg cooler to pour coffee on tap for FREE, so you can quickly start to dispense our products. We include FREE keg delivery on a weekly basis. Our kegs are FREE of deposits. We give you FREE cups to sample our products with. We provide nitrogen gas for the cooler. We do a FREE periodic line and cooler maintenance and give you FREE signage and point-of-sale support. 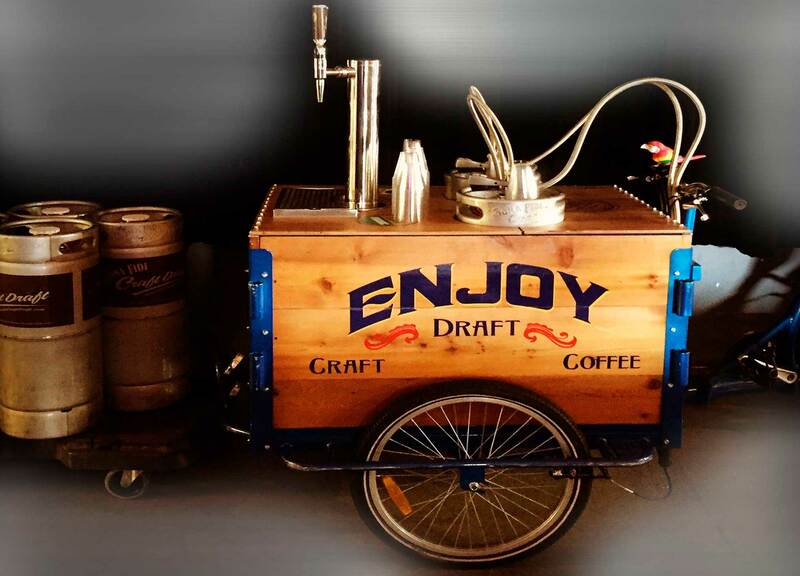 We will also do a FREE promotional event with our cool draft coffee trike, to tell your friends and neighbors that you are now selling Bona Fide Nitro Coffee & Tea. And finally, we will give you a FREE listing on our website map to help drive traffic your direction. In short, we have to ask you to pay for our product but a lot of our program is FREE! Office Coffee Service and Direct Store Delivery by Wholesale Coffee Suppliers in San Francisco, Los Angeles, San Diego, Las Vegas, Denver, Boston, Phoenix, and other select markets. PET kegs Available from our Webstore, Ship UPS in USA and CANADA. 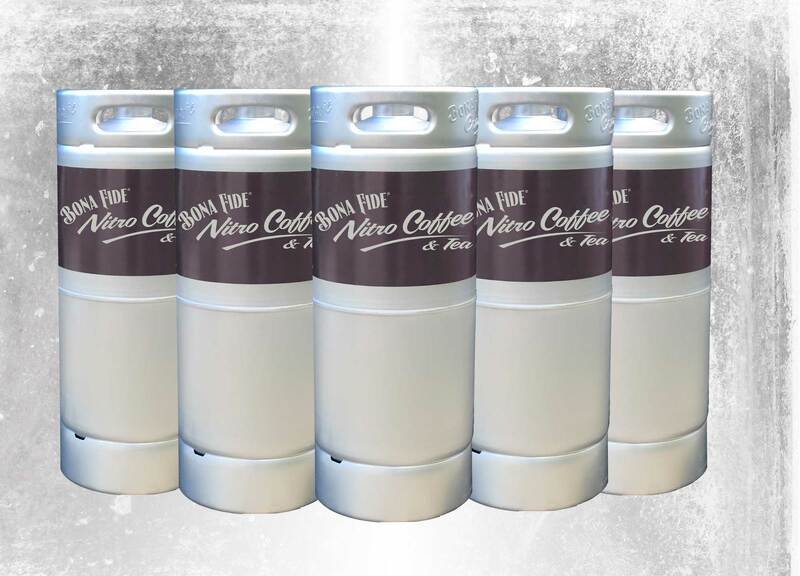 Bona Fide ALLIANCE Nitro Kegging Service for Coffee Roasters and Industry Partners. Already have a keg system installed? No problem we are happy to make sure that you never run out of the product. Bona Fide Nitro Coffee proudly offers several of our products in a UPS friendly PET disposable keg. We can ship 5 gallons of our products via UPS anywhere in the USA. In fact, we are a first on Amazon to sell a full beverage keg. Our Petainer kegs are easy to install and fully recyclable. After dispensing you just deflate the empty keg using an attached tool, and deposit it into the recycled waste bin. Bona Fide Nitro Coffee is brewed with our proprietary, food-safe, Craft Draft process, cooled down to 40° F (4°C) and infused with pure nitrogen gas. It is NOT cold brewed or cold press iced coffee. When it is poured out from the keg under pressure, the micro-fine bubbles of nitrogen come out of solution and gently cascade upward displacing the coffee which “falls” downward creating a beautiful visual presentation in a clear glass. The nitrogen bubbles create a thick creamy head that floats at the top of the beverage. Bona Fide Nitro Coffee and Nitro Tea is very flavorful, smooth and refreshing. The flavor profile of each of our products is authentic, unique and extraordinary. Our products are made with the best organic and natural ingredients available, purified water, organic coffee (or tea) and naturally derived, pure nitrogen gas. Feel free to navigate through our website which contains a lot of information about us, praises from our customers, our relationship with nature, our sustainability values and our commitment with our customers to create the absolute best Nitro-Infused Products on Tap. Disruptive innovation is often defined as the kind of innovation that creates new markets. Bona Fide Fair Trade Certified, Organic Craft Draft Coffee “On Tap” has certainly been such an innovation — and since its introduction on campus it has been received with incredible enthusiasm by students and staff. Our coffee sales have seen exponential growth and are Carbon footprint has been reduced. Win-Win-Win! “We are very excited to get into our second year with Bona Fide Brewing Company. As a business, they have such a high ethic that we are now migrating all coffee and tea products to them. Their products have thus far been unparalleled for taste, appearance, satisfaction and (most importantly) value. Having the innovative new keg delivery system helps keep us as forefront as possible with cutting edge food trends and delivers a quality product that is second to none. It is so good that we have to battle our employees to stop drinking too much before we open the doors (the keg coffee has ruined me for any other cold or iced coffee). We want to try to get the coffee in the same tap area as our beers some time this year because we think that customer will really enjoy this unique option. Our opinion is that their products and services are an integral part of our concessions mix and we think that by providing a well-rounded coffee and tea product from Bona Fide we’ll increase our sales and have happier customers.